1 Earlier during Thanksgiving week I prepare the onions for this dish. It's a bit of a pesky task, but well worth the bother. 2 The hard part: peel all those little onions and just barely cut off the slightly hairy stem end. 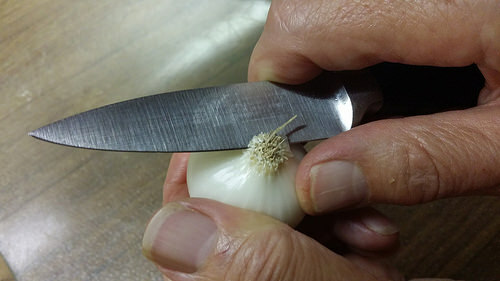 Make a shallow cross cut in the same end of each onion to help prevent the onions from coming apart during preparation. 3 Put the onions in a sauce pan or fry pan big enough to hold them with water just to cover them. 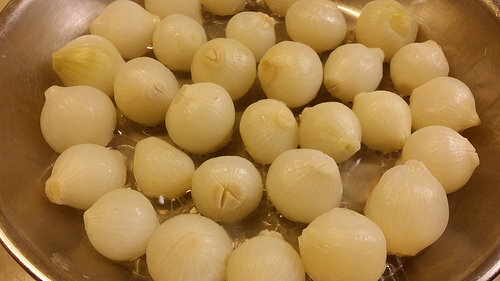 Wash the onions by running water on them a couple of times and then draining the water. 4 Add water just to barely cover the onions. Cook them, uncovered, over medium heat, until the water almost evaporates. With a sharp knife, check to see if the onions are cooked. The knife should pierce the onions pretty easily. 5 Store the onions in a jar or other container with whatever liquid remains in the refrigerator. 6 This is one of the last dishes we prepare on Thanksgiving Day because it doesn't take long and the finished dish doesn't improve with sitting on or off the heat. 7 To continue, In a large saute pan, or fry pan, melt the butter. Take the pan off the heat. Add the flour and mix until quite smooth. 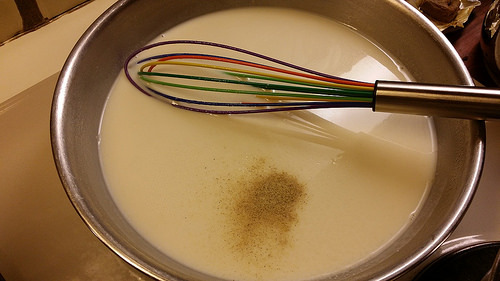 Add the milk all at once with the pan still off the heat. Mix well. A large wire wisk works well although a wooden spoon will do also. The mixture will not be completely smooth but that's alright. 8 Place the pan back on the heat and cook, stirring constantly. 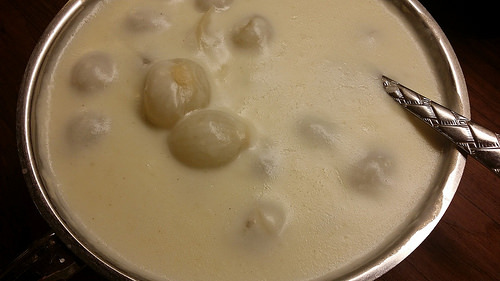 As the mixture just begins to bubble, it will thicken. Keep stirring. Add the white pepper and salt. Then add the onions. 9 Your dish is ready. 10 We've found it doesn't take well to being kept in the oven. It is better to leave it in the pan and, if needed, just before sitting down, give it another shot on the heat until it bubbles again.